Oh Mary, lucky you! It is nice to leave this snowy cold weather behind for California's warm climate. Your photos even look warm to me, the beach and park look beautiful. Lovely views and photos! Thank you for hosting, enjoy your new week ahead! Your California mosaic is lovely. Always enjoy joining the party and thanks for hosting! Sounds and so looks like a great trip! Great mosaic! Hope to join in on the fun soon! What a treat it would be to visit California! I'm sure you must have enjoyed every moment of warmth while you were there. What a great trip! What a wonderful trip, Mary! Beautiful, warm, colorful images! What a great little break away from the snow. I love the architecture you've shared at Balboa Park, and once again, the iPhone has produced fabulous photos. How lovely for you to have been able to escape the cold and snow and ice to the warm and sunny temps of beautiful California! The architectural shots are spectacular and the ocean is tempting! Thanks for hosting and have a splendid week! I'm back after quite some time. Thanks so much for hostessing. Hope the weekend is going well. I can see why you went along for the drive Mary. What a nice change it would have been from the cold. Have a wonderful week. I missed Mosaic Monday last week. Thanks for hosting. I love San Diego, Mary. I've been fortunate enough to accompany my husband on many business trips there. A lovely respite for you Mary, soaking up the suns rays! It looks so interesting and beautiful architecture. I missed the MM party last week too - I had a post 'ready to go! Always love joining in Mary, thank you for hosting Mosaic Monday. Nice that you got a taste of spring last week. Lovely photos this week Mary, looking forward to more next week. Great pictures... and I would do anything for a trip to California. Thanks for hosting. I knew immediately at picture #1 that you were at Balboa Park. The architecture is distinctive. I went to college in San Diego and lived there for 12 years. It is a beautiful spot with perfect weather almost every single day. I do recall one day while I was in college, that it actually snowed, but the snow melted the minute it hit the ground. What a treat! It has been so very cold here this winter. As I type this morning I am listening to the arctic wind blast against my windows! Beautiful California-we lived in Mission Viejo years and years ago-I remember thinking it felt like a little slice of heaven-gorgeous blue skies! We absolutely love San Diego. In fact all of the Southern California area that we visited in 2010, we fell in love with. Your collage brought back great memories. It has been a while, but I wanted to link up this week with some winter scenes! I think beautiful California would be great right about now ... LOL. Thank you for hosting. I recognized your photos right away. 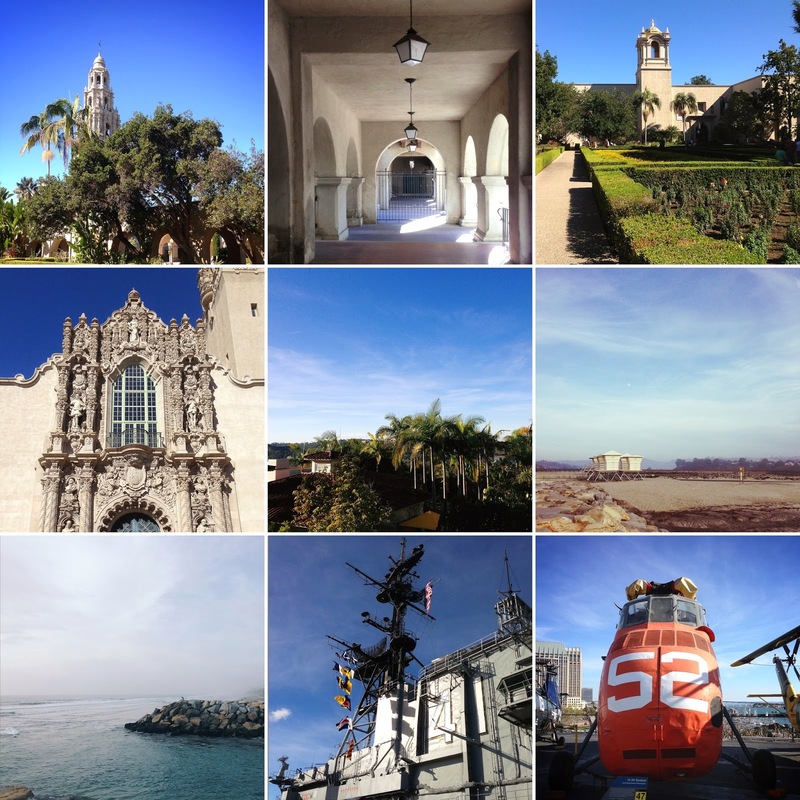 We were in Carlsbad last January and spent a day at Balboa Park. Lovely sunshine and warmth is what I remember. I hope the snow is beginning to melt for you, or at least stop falling. Your trip pictures are lovely. How wonderful to at least get to enjoy warmth and flowers and sunshine for a few days. You certainly got some great photos. I can't take a decent picture with my cell phone to save my soul. 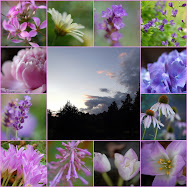 Great pics and the blue theme, Mary! 65 degrees sounds divine just about now! How beautiful your photos are!